So, on to this week's manicure. I am in love with my nails. I've loved these polishes separately, I can't believe it took me so long to use them together. My husband actually said he thinks it is his favorite mani so far! Wow, that says a lot. I do my nails 2-3 times a week. Although this week, I am on day 5! I'm going to keep wearing it till they chip and look bad. May I remind you I have 4 kids? That's a lot of dishes, laundry, and diapers (hand washing)!! I literally just took this pic! The secret? On day day 3 or 4 I use Essie's Good to Go! and it really helps extend my manicure. I've read applying a top coat every couple days will help. This, by far, has worked best for me. Oh, and my China Glaze Strong Adhesion Base coat is awesome too!! I used my Sephora gift card last night. I decided to be completely frivolous and buy something I wouldn't spend $50 cash on.... eek! Sephora got it back in stock online yesterday and I ordered it. I was so excited that 1) I had finally decided how I was going to use my gift card and 2) I will get to see what all the hype is about! I told my sweet husband that I ordered it, and he was like "oh, ok. good for you" lol. I have no one to share this with seeing as my bff is a gay man. hmm. I need more girlfriends. I am going to brunch with Kate on Sunday, she'll appreciate this awesomeness! I hope everyone has had a great week and an even better weekend! Can't wait to see all your nails, Ladies!! I love that pink nailpolish. So pretty. That polish held up REALLY well! I'm impressed! 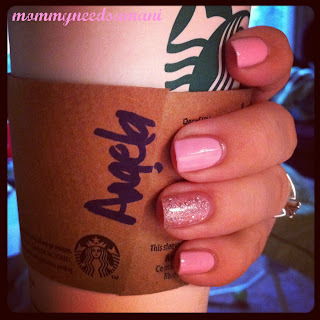 Love the pink with sparkle accent finger. 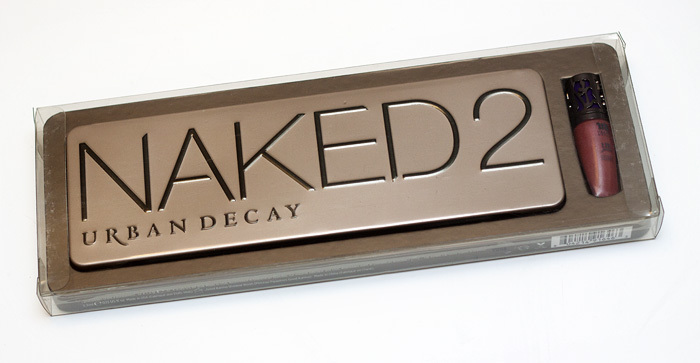 I just got the Naked II pallette myself and I don't think I could love it more. Enjoy!! GORGEOUS nails!! you are going to LOVE the naked2!! Wow! Your nails looking amazing after 5 days! Do you have a special top coat that you use to keep it that long?! Yay for the Naked2 palette! I haven't bought one yet, but it is something that I've been really wanting to try. Sooner or later I'm going to "bite the bullet" and splurge. Us mom's need to splurge on ourselves every now and again. What color is that pink base? It's amazing!